A case will soon be filed in the Madras High Court to understand the source and use of foreign funds by animal rights organisations. CHENNAI: A case will soon be filed in the Madras High Court to understand the source and use of foreign funds by animal rights organisations, a native cattle breeder said on Thursday. "We plan to file a case to investigate the source of funds of different animal rights organisations in India and their links with foreign animal breeding organisations," Karthikeya Sivasenapathy, managing trustee of the Senaapathy Kangayam Cattle Research Foundation (SKCRF), told IANS. According to Sivasenapathy, organisations like People for Ethical Treatment of Animals (PETA), Blue Cross, Animal Welfare Board and others have to be investigated as to their source and use of funds and their links with other foreign organisations. An active supporter of Jallikattu - the ancient bull taming sport - Sivasenapathy said these foreign organisations are out to wipe out India's native cattle breed so as to bring in foreign animal breeds. "Not a single farmer using native livestock and manure for farming has committed suicide," he added. According to him consumers of organic farm products and the government has to lend active support to native such farmers by raising their voice when threatened by foreign commercial interests. 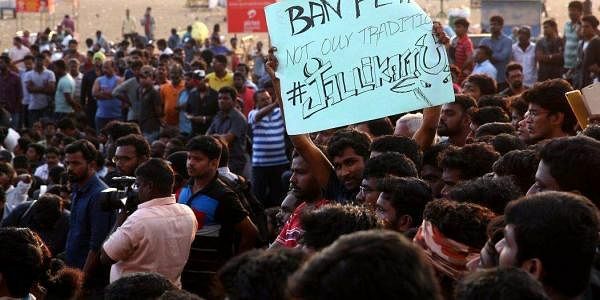 Referring to the massive protest in support of Jallikattu across Tamil Nadu, Sivasenapathy said it was expected as the ground work was done for the past couple of years. "We addressed several college students on the importance of preserving native breeds and the commercial interests of foreign organisations," he said. Himakiran Anugula, Secretary, SKCRF and an organic farmer in Tiruvallur district, said: "We do not need globalisation that ruins Indian villages and its environment. We carried out our campaign in favour of Jallikattu since 2013 and took it to the social media and to educational institutions,"
According to Sivasenapathy, the fight is not just for Jallikattu but the preservation of several native cattle breeds of many Indian states like Gujarat, Maharashtra, Madhya Pradesh, Andhra Pradesh, as well as sports like the Rural Olympics in Punjab.